The book is softcover but in a hard presentation box and approximately 120 pages in length and hand signed on the cover. We have one print run of 500 copies, more than half of which were sold during the exhibition. It is my pleasure to offer the remaining series to my readers. We have also made the price as reasonable as possible: US$65 for the book plus $15 for shipping anywhere in the world, with all proceeds split equally between Lifewire and the CWA. This is only possible because production has been partially sponsored by Fuji Xerox Hong Kong. Shipping and fulfilment will be handled directly out of Hong Kong by Chun Wo Construction & Engineering on behalf of the charities. It’s a win-win for both those who’ve asked for a book and the causes. The ordering link will be open for two weeks and we will ship shortly thereafter. Orders have now closed, though there may be a few still available via Ida Chan. 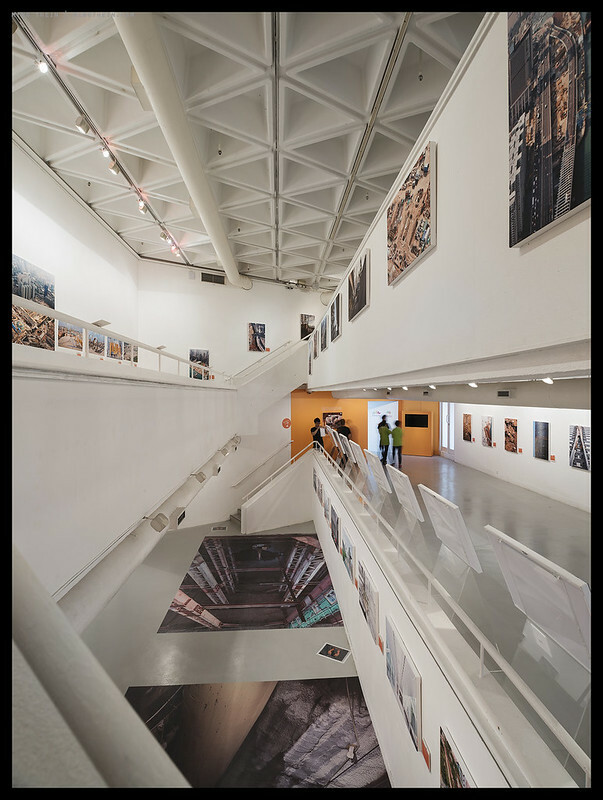 In addition, selected prints from the exhibition are available in signed and certificated editions of 3. They are 36×24″ on canvas using the same hardware as the Ultraprints (but obviously not Ultraprints in the traditional sense) and produced by myself and Wesley Wong at Giclee Art. We have sold more than 60 already and there are a few left. If you would like more information on what is still available, please contact Ida Chan at Chun Wo directly. Thank you for your support! Now for a quick tour of the gallery – it’s a rather large (my guess, 15-20,000sqft) space. Our 36×24″ canvases were perhaps on the small side – and there were over a hundred of them! The images are the product of more than a year of work and ~25 shooting days. 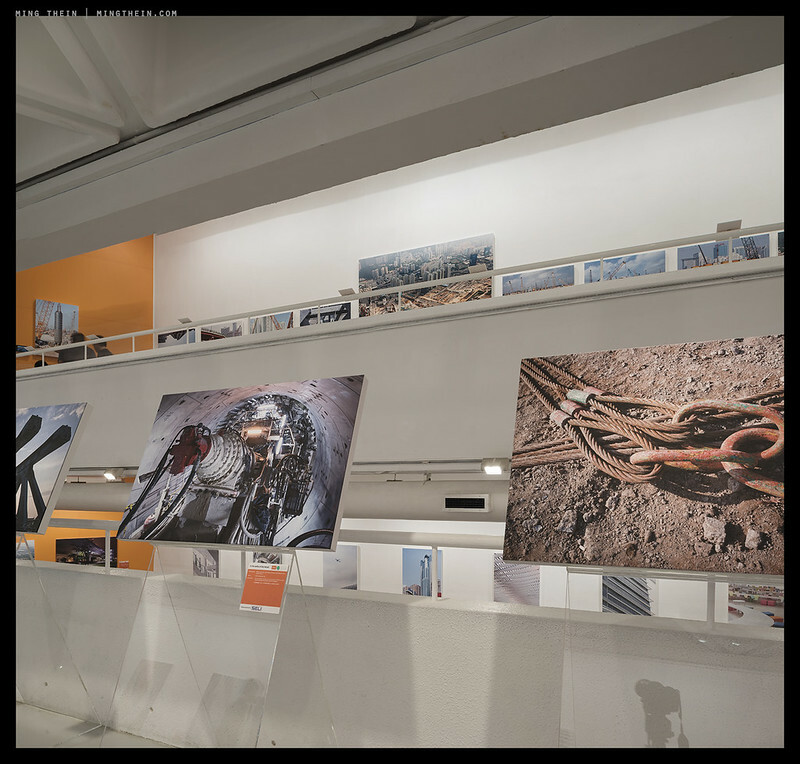 The exhibition was divided into four sections to use the space as much as possible to create a sense of progression – for those in construction, the aim was to showcase their work and present something different. For the public, the purpose was education – to show the story and work behind those things (buildings, infrastructure, etc) we take for granted on a daily basis. You enter through the ‘people’ gallery, which celebrates and showcases the small but specialised and important tasks that mostly go unseen and unappreciated. The second gallery is both a display of scale and context – the larger projects and developments can only really be appreciated from the air as there is simply no way to get a sense of scale from ground level. Moreover, it is a historical documentary of sorts – once the projects are complete, few will remember what was there before or work done. The third gallery is a change of pace and my personal favourite – it isolates and abstracts individual elements to form and color and looks for beauty in both the tools and the completed results by eliminating the distractions. 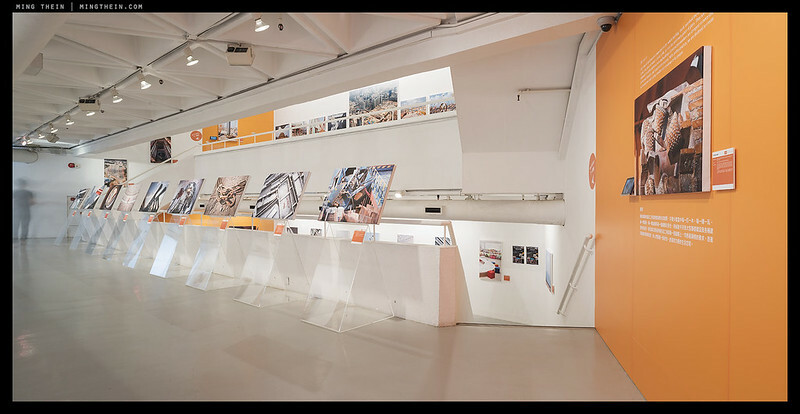 We finish with a ‘formal’ architecture gallery of the world we know and love – the shiny, new completed product. 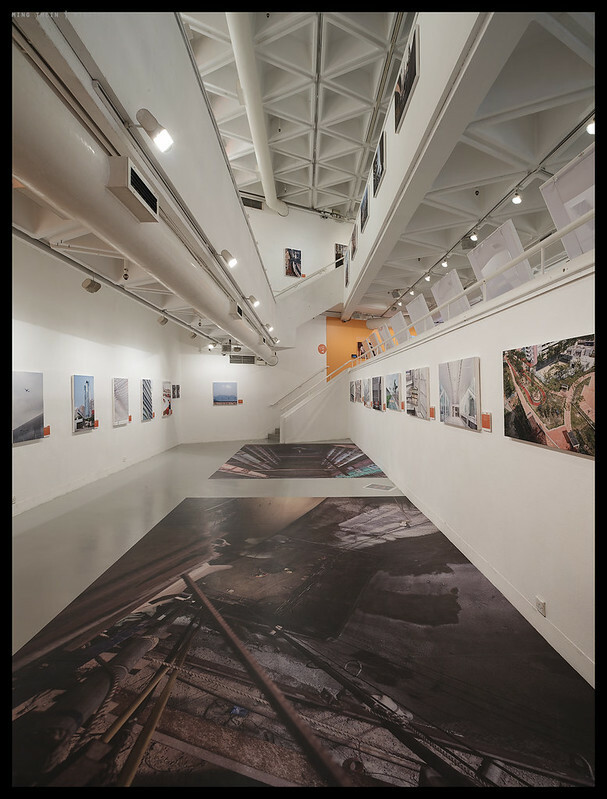 Touring the exhibition in this order thus presents a view from the unfamiliar to the familiar, to create a new appreciation of our built environment – construction is really about creating a means to connecting people, not just physical/mechanical elements of structures. Finally, a huge thank you must go to Derrick Pang, the team at Chun Wo, K Production and all of the sponsors for making this possible! 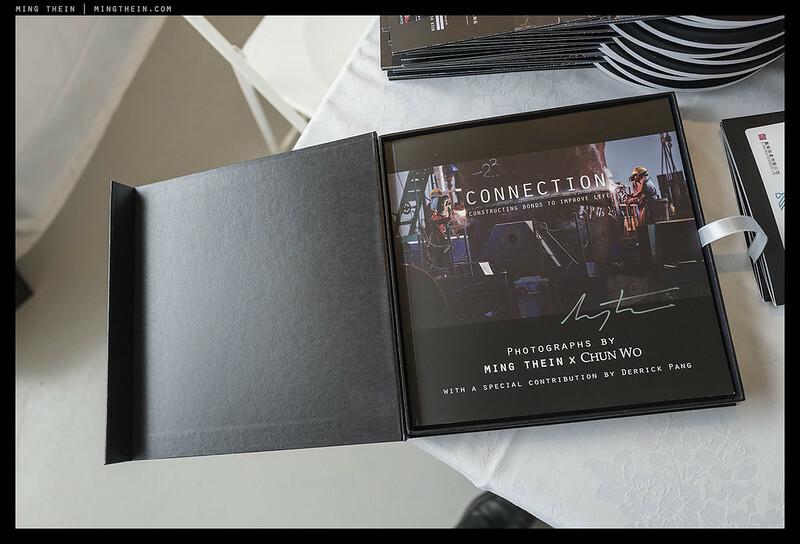 Thank you very much for your kind support on the purchase of Photo Album for “CONNECTION Charitable Photo Exhibition”. A confirmation email will be sent to you by us separately if the online order is successfully received. The photo album will be delivered by the end of July to the delivery address. Should you have any queries or need our further assistance, please kindly contact us at cwcc@chunwo.com. All photo albums have been delivered by today. Please let us know if you do not receive it within next 7 days. My copy arrived yesterday and I love it… all of the photos are truly exceptional as always. Print quality is excellent imo and the postcards are a nice touch as well. Bravo Ming! Glad to hear the exhibition was a success, hopefully there are many more to come! This looks outstanding! I must admit that although I have read this site from the beginning, I have yet to purchase anything and this book will be my first. About to pull the trigger on some workshop videos and saving for an ultraprint someday though… Thank you so much for all your images and words Ming. They inspire me every day, and I’m sure this book will as well. Ordered the book via Paypal! I wish it doesn’t take too long to get to Andorra. Thank yoy Ming for your effort and dedication. I am glad to meet you in the exhibition. The pretty lady told me that Ming was over there! Thank you for signing on the plastic folder as well. Hope to see you again in Hong Kong in coming future. My last few weeks have been pretty hectic. Just getting a chance to catch up on your blogs. Congrats on the exhibition. I just ordered the book. So glad there was some left. Finally have an official “Ming”. It took my order so I hope that means there are still some left. Will be on a living room table display. We are so happy you found a way to finally produce a book! It’s delivery well be x-mas in summertime! Please consider to produce more in that direction or a textbook on (high level) photography! Great news. Finally, I can get an original book with signature from you. I tried to buy through paypal using mobile or pc but somehow it was not accepted. I even registered an account with Paypal just for this but it seems that I need to transfer funds to Paypal first. That takes a few days 😦 Only from Singapore I guess. Buyers from other countries can just pay with their credit cards it seems. Any way around this? Try using it as an anonymous user without logging in or an account (you may need to clear history first) – you should just be able to use a credit card even in Singapore. Yes, I cleared the browser history and tried using my friend’s credit card and another e mail address but it still won’t go through. Bad luck I guess. Anyway I hope I have the opportunity to attend one of your courses soon. Please let me know if there are other avenues to purchase the book. Thanks. Thanks for sharing the views of your exhibit. That is truly an impressive show, unlike that for any photographer’s work I’ve ever seen. The scale is immense and the result, for the two charities, impressive. I hope this means your work is established in the minds of those bidders as being of high value. Somewhat similar events in the U.S., annual wine auctions in Napa and Sonoma counties in California, churn up millions of dollars for worthy causes, while at the same time bolstering the reputations of of the wineries which participate. They often turn into bidding wars among people with entirely too much money trying to best one another for bragging rights — but the amazing sums bid for cases of wine enhance the perception of value attached to the brand names. Let us hope this turns into a vintage year for Ming Thein. Looks like you had a great venue for your well deserved exhibit, Ming. I’ve ordered a copy of the book; we American are indeed time zone laggards but, on the plus side, we do wake up ready to shop! May this be the first of many books. Just ordered the book via PayPal. Hope it doesn’t take too long to get to the U.S. Can’t wait! Congrats MIng – just ordered. Ming, congratulations with the exhibition, that’s a great achievement! And what a noble cause, particularly during this month. Ordered the book, can’t wait to see it! It looks like a really cool galerie, I love the orange. And boy it looks huge, so many images! Why did you go for canvas? 20,000 sqft and about 110 canvases. Smallest 36″, largest 90″. Canvas for ease of handling and framing costs – plus at that size, it looks better especially since there aren’t any reflections from glass. Great pricing, I am getting one. Just placed my oder hope I also made it on time. My first ‘coffee table’ (photography) book I have ever bought and looking forward to the experience. Hi Ming just curious I got confirmation of the PayPal payment (receipt) as its reflecting on the PayPal account. When do we expect communication of the item being sent etc. Unfortunately I never got a reply from your partners but didn’t want to lose the opportunity of securing a book. I just wanted to know if there is any sort of confirmation or communication that is sent from Chun Wo with the orders? – I apologise for the inconvenience. If it accepted payment it should be fine. I honestly have no idea what’s happening on that end as I’m not involved with the sale – may I suggest you email Ida Chan (email in the post) to check? I actually did – initially when wondering about the courier/tracking as that will be critical for me – but never got a reply from them. I’ll follow up and see. Thanks. Hi Ming. All I can say is I really hope there’s a way I’ll know when the book arrives this side – we have a tedious process here where anything coming over blind can be a problem – I look forward to the book. However I must admit its unfortunate the sales side of this process isn’t as communicative (no response) but I don’t see this as a reflection of your efforts. I will be looking at pulling the trigger on some workshops within the year. Thanks for an amazing blog and all your lovely work. I believe the Chun Wo team will be sending out confirmations shortly. Just got my confirmation. Looking forward to receive it and hope it all gets here in one piece. Thank you for sharing your work in another personal medium. Love your choice of charities, instant order. A fantastic achievement on many fronts Ming – getting the whole exhibition organised in the time frame available to you as well as the money raised for charity (btw, your Lifewire link is broken). Congratulations Ming. Such a great success could maybe be repeated. It’s anyhow amazing what you and Wesley and all others involved have done. It is such things that makes a difference. Hi Ming! Was trying to order through your link but the transaction kept failing to get through, even after trying various cards from various people, not sure what the issue is here. Might it be the Paypal website experiencing problems? Would there be any other methods I can transfer the funds through? I’m from Singapore btw. Thanks and congrats on your successful exibition! I think it may be paypal. Can I suggest you try with a mobile device instead? Sorry about that! I had a problem with paypal too. If you are registered with paypal, try not logging in and instead continuing as a guest, and using a different email – that worked for me. Thank you! This was (and still is, ongoing) an awesome assignment. I’m on of those who is too far from Asia to see your work in print, and I’ve longed to see it. Computer screens, for me at least, may be the worst way to view a photographer’s work. Book ordered. Ming, It was wonderful to see you an your works up close and personal. I was moved not just by your works, but also your deep sense of commitment and belief in the underlying causes. Can’t wait to have your photograph up on my wall. Thank you – it was a pleasure to meet you, and thank you again for the support! Wonderful job! Congratulations on a successful exhibit and also on raising so much for charity!!! Ordered the book. Congratulations on the success of the exhibition and the fundraising Ming. I come from a labor family. I will look forward to receiving the book. I am also excited about receiving my first print done by Wesley. Also, good luck on finding your new home for your family. what a nice impression of your exhibition, guess it looks even better when you are there. I ordered the book, hopefully it wasnt to late. Ordered! Hope I wasn’t too late. The Exhibition Report and Images are great as well! Congrats again! Btw, looks like many of these images were shot with the 24 PC-E? I meant the images of the exhibition. Amazing work & effort,worth to collect! Amazing work & effort,worth to collect.Thank you Ming! Ordered! Hope I made it in.